Federal energy regulators last week defended a controversial policy shift on the government's climate analysis obligation in natural gas pipeline reviews. Because gas infrastructure demand follows gas production, "it is unknown — and virtually unknowable — whether the gas to be transported on the Project will come from new or existing production," federal counsel wrote in the brief. 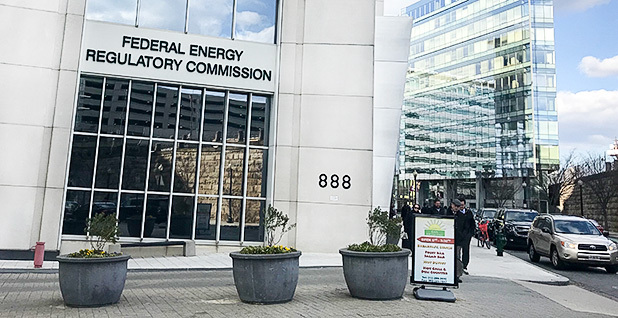 "Absent that basic information, it is nearly impossible to assess whether there will be any additional production activities in connection with the gas to be transported on the Project," FERC attorneys argued. "As a result, any greenhouse gas emissions from any additional, incremental production activities are not reasonably foreseeable." FERC's brief is a response to a lawsuit filed by the nonprofit group Otsego 2000 contesting the agency's decision last year to scale back its consideration of climate impacts in natural gas project approvals (E&E News PM, May 18, 2018). Six states and the District of Columbia last month called on the D.C. Circuit to scrap the policy shift, which was announced in a procedural document denying a request to rehear FERC's authorization of Dominion Energy Transmission Inc.'s New Market Project in New York. FERC's Democratic commissioners, Richard Glick and Cheryl LaFleur, supported the denial but disagreed with the inclusion of the policy change. Both cited the D.C. Circuit's 2017 ruling in Sierra Club v. FERC, which ordered the agency to more closely examine downstream greenhouse gas emissions from the Southeast Market Pipelines Project, which includes the Sabal Trail pipeline. "This decision clearly signaled that the Commission should be doing more as part of its environmental reviews," LaFleur wrote in her dissent. After the D.C. Circuit sent the Sabal Trail review back to FERC, the agency wrote that it could not find a "widely accepted standard" for determining the significance of greenhouse gas emissions, rejecting tools like the social cost of carbon and state emissions inventories. "The Commission's only tool to address any concerns it may have regarding downstream greenhouse gas emissions would be to decline to authorize the pipeline project," FERC attorneys wrote Friday. "Of course, in any particular case, parties are free to seek judicial review of the Commission's determination as to whether or not upstream and downstream activities are project-related effects for purposes of NEPA," FERC wrote in its reply last week. Final briefs in the case are due March 8.